Most people, when they think about island life, see images of tropical islands somewhere in the Pacific or Indian ocean; palm trees swaying in the gentle breeze; sipping on rum cocktails while people/wildlife watching on the beach; digging their toes into the warm sand. 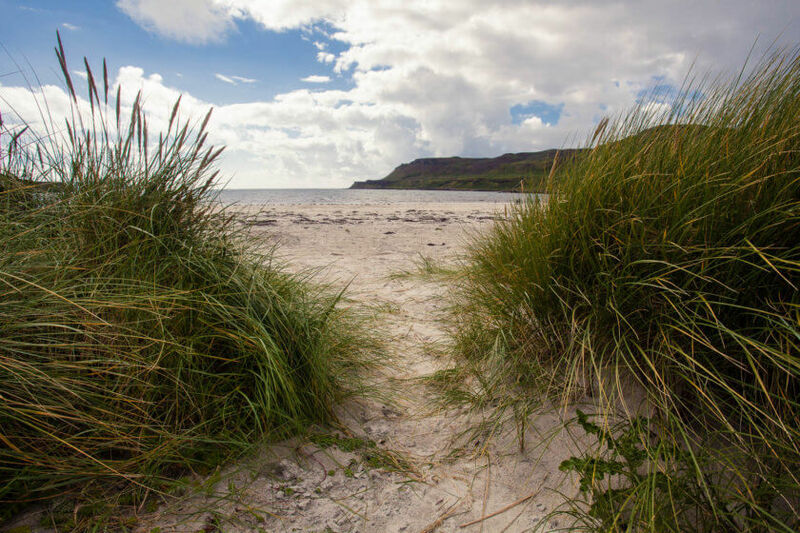 But when I think of island life, I envision something slightly different – the serene beaches and lonely islands of the Scottish Hebrides. Scotland is an island nation. Over 800 islands are lining the Scottish coastline, particularly on the west coast where the Inner and Outer Hebrides form some of the largest island groups of Scotland (others being the Orkney islands or the Shetland islands). Some of my favourite holidays have brought me to the Inner Hebrides, of which the Isle of Skye is the most famous. 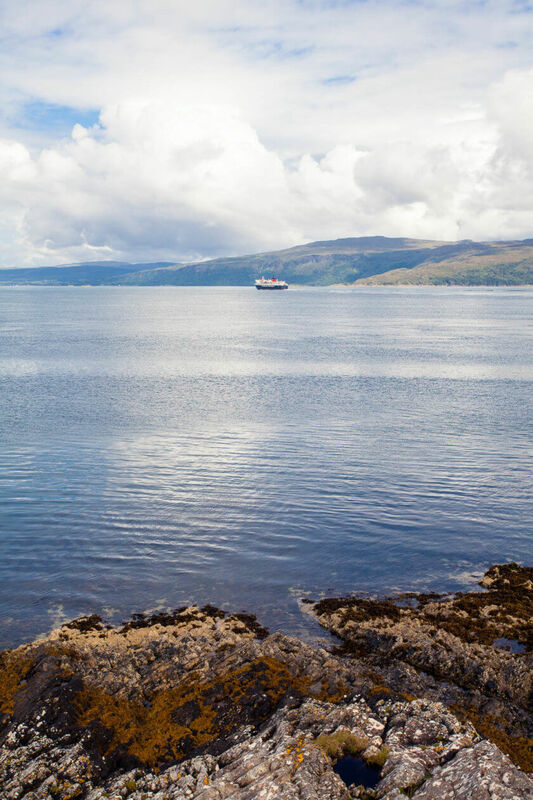 This however, is a travel story from a less known island south of Skye: the Isle of Mull. I can already see the island, before I board the ferry in Oban. Behind me lie 3 hours I spent in the car to drive from the city to the little harbour town, also known as the Gateway to the Isles. In front of me, are three days of island hopping around the Inner Hebrides. The first island I see across the water is the Isle of Kerrera, but it will have to wait until another trip. Behind it, much further in the distance, but distinctly visible due to its high peaks, is my destination for the weekend: the Isle of Mull. The journey aboard the ferry takes about 1.5 hours and soon enough, I get off the boat in Craignure, barely populated enough to be called a town, but a village? A village it is. Mull is the fourth largest island in Scotland (after Lewis & Harris, Skye and Mainland Shetland), but inly 2.800 people call the island their permanent home. 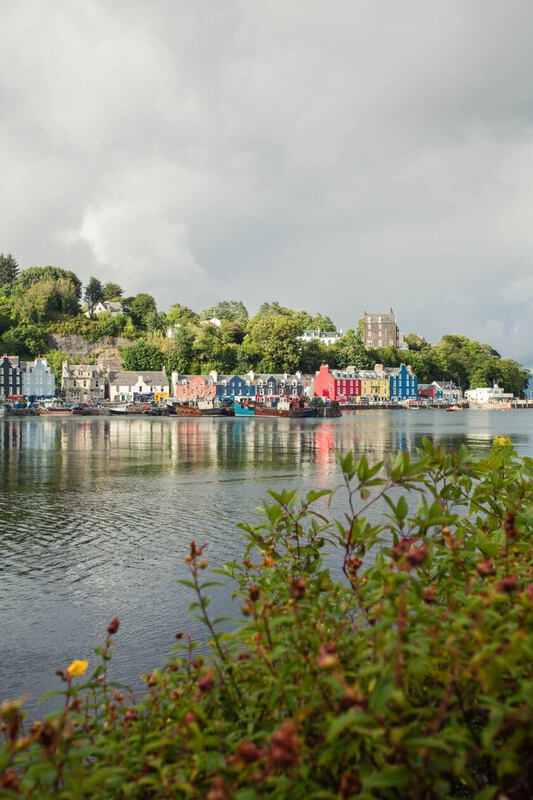 Except for a few villages and the small town of Tobermory in the northern part of Mull, there are just a few tiny settlements spread out across the island. 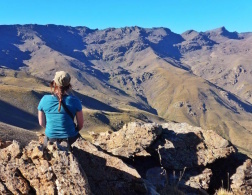 The majority of the land is left to itself, waiting to be explored by keen travelers. I decide to spend my evening at my accommodation. I brought a single-use BBQ with me from the mainland – as a vegan, the local cuisine of Mull is not up my alley, but if you like fresh seafood and strong cheeses, I recommend you find a restaurant to try these. With the evening sun tickling my nose until well after 9pm, I take a walk along the sea shore and stare out into the distance. Back there I can still see the lights of Oban, but now they seem like a world away. The next day is jam-packed with adventure – and that requires me to rise early. Island hopping would not be island hopping if I stayed on just one island, and so I make my way to the port of Fionnphort. From here I plan to explore three small islands that lie off the coast of Mull and are easy to reach within a few hours on the boat. First up, is the Isle of Iona, a brief 10 minute ferry ride across the sound from Fionnphort. The island is famous as a place for spirituality and tranquility. The beautiful Iona Abbey used to be the religious centre of Gaelic monasticism; from here Irish monks spread Christianity among the native Scots and Picts. Even though the abbey is ruined today, it is still a significant site for Christian pilgrimage in Scotland and you can visit it for a small fee. 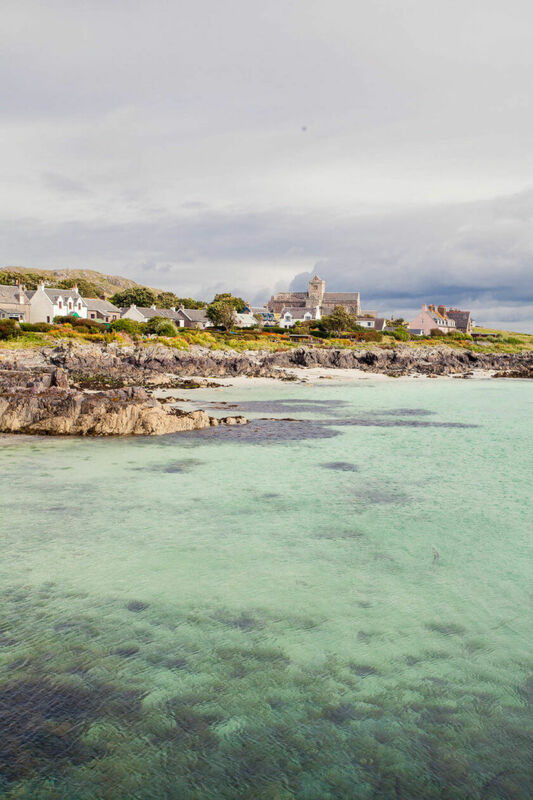 If you’re more interested in the natural landscape of Iona (and escaping the small groups of tourists visiting the island during the summer) then I recommend going on a walk along one of Iona’s many trails. 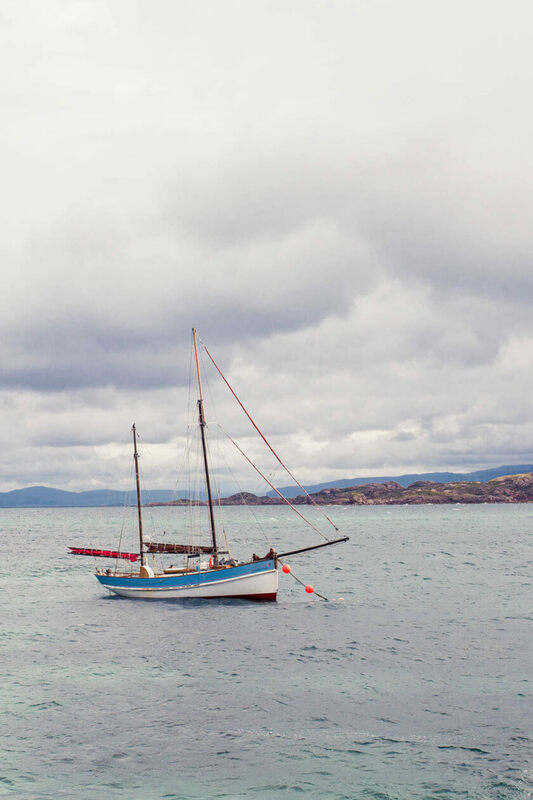 Around noon, I find myself back at the harbour of Iona, ready to board a small boat to whisk me away to the other islands on my itinerary. 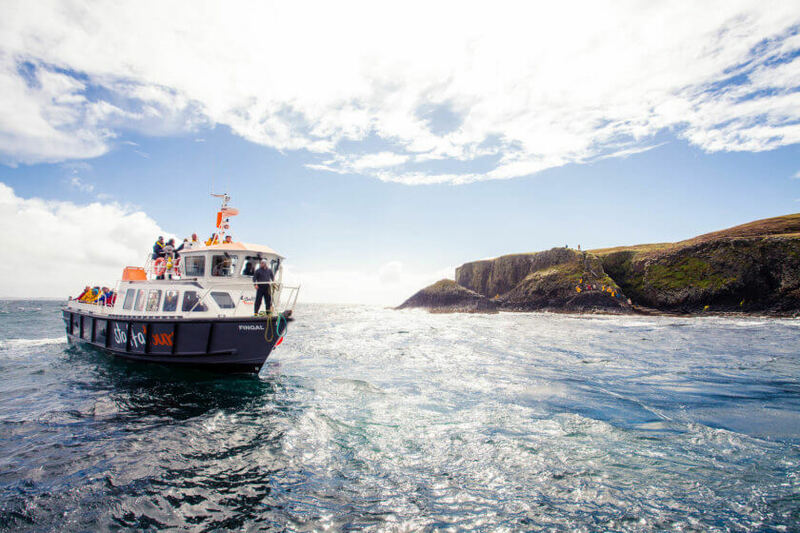 Staffa Tours organises a variety of different tours to the nearby islands around Mull, starting from Fionnphort and Iona or all the way from Oban. I chose to join the Treshnish Isles Wildlife Tour which stops off at the Isle of Lunga and the Isle of Staffa. On the Treshnish Isle of Lunga, which is uninhabited and does not even have a fixed jetty, I find myself as far away from society as I can possibly think. The only sign of civilisation is the little boat waiting for my return off the shore, and the handful of other adventurers who have dared to venture out into the rain with me. The highlight on the island is without a doubt the puffin colony on the western cliffs. The puffins come on land here to breed between May and early August, and spend the rest of the year at sea. Surprisingly, they are not afraid of humans – but quite the opposite are attracted by our photo-hungry group of travelers waiting on top of the cliffs. Our presence keeps the bigger and more aggressive sea birds at a distance, so puffins know it’s safe to land and feed their young when humans are around. After two rainy hours on the island, we break away from the puffin colony and make our way back onto our small boat. Sailing back towards Mull, we stop one more time at the Isle of Staffa which is world-famous for its bizarre basalt rock formations. Similar formations can be found in Iceland, and of course across the sea on the coast of Northern Ireland. Some people believe that the basalt rocks were created by giants, and formed a staircase connecting Staffa with Northern Ireland under the sea. 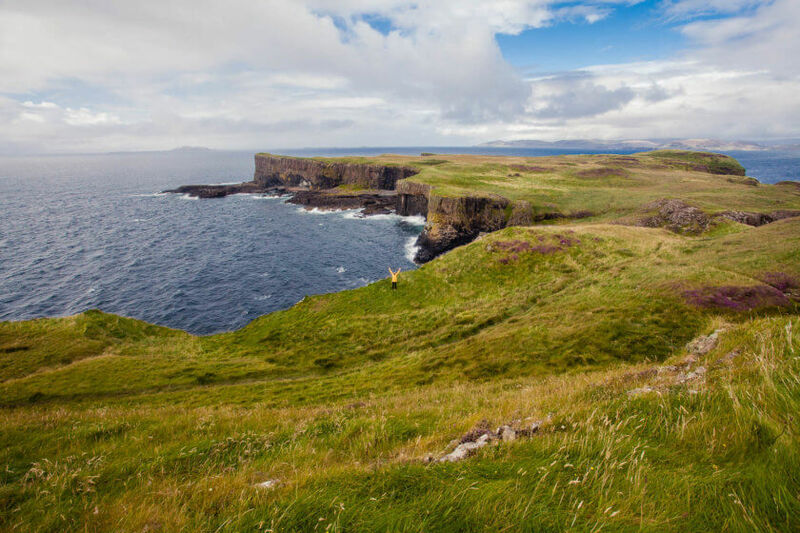 On Staffa have enough time to visit Fingal’s Cave and climb to the top of the island for magnificent views over to the Isles on Iona and Mull. 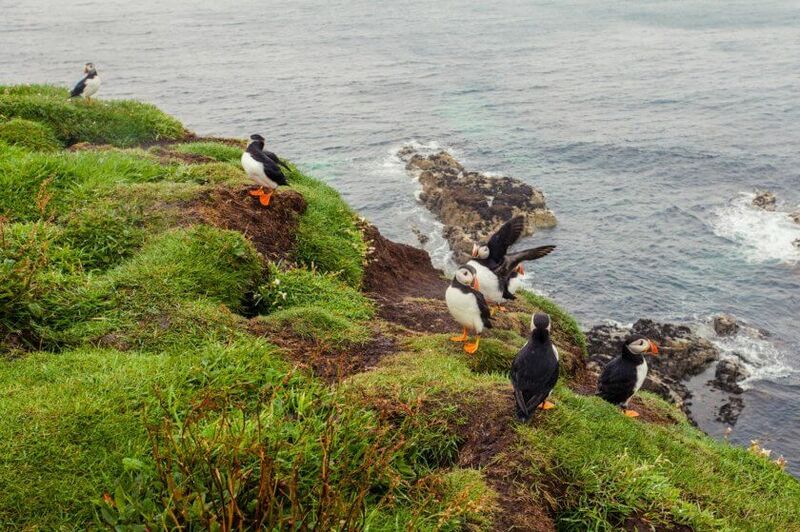 You might be lucky here as well, and spot some puffins, but because the island is much busier than the Treshnish Isles, chances for these sightings are lower. Happy and isled-out I step off the boat in Fionnphort and make my way back to Craignure for a second night on the Isle of Mull. The next morning I wake up to my last day on Mull, but again, I can’t help but wanting to explore yet another island off the coast. 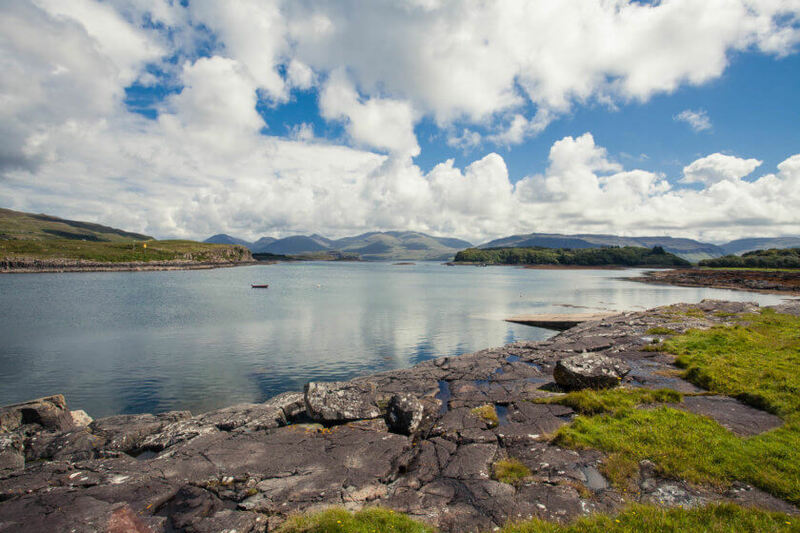 A thrilling drive along one of Mull’s many single-track coastal roads, I reach the tiny ferry landing that connects Oskamull on the main island with the small island of Ulva. I summon the ferry using old-school technology – flashing a piece of red wood to the ferry master across the water, I let him know that I would like to get a lift onto the island. 5 minutes later I find myself in a small boat, hardly big enough to be called a ferry. 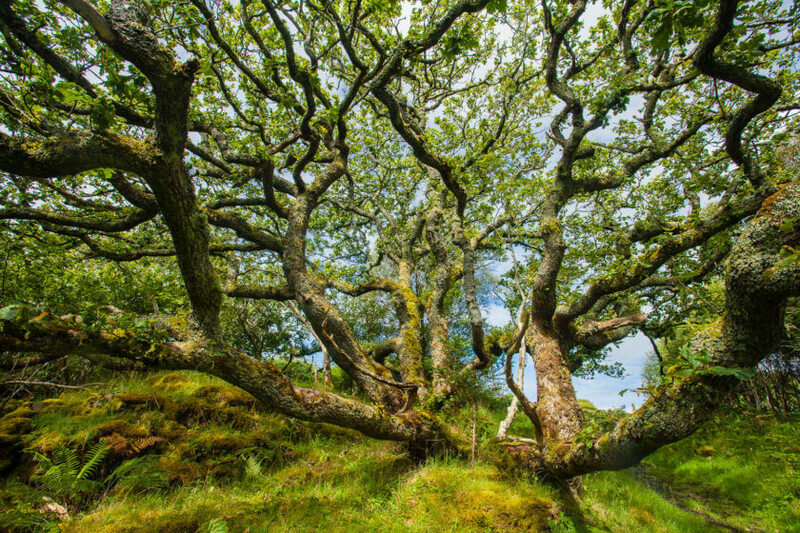 The Isle of Ulva is privately owned, but the trails criss-crossing the islands are free to explore. I decide to follow the path that leads through the woodlands first and later along the southern shore of the island. I walk through enchanted forests, climb trees that are covered in soft moss, pick up rubbish that was washed ashore on one of the beaches, and search for ripe fruit in the blackberry shrubs along the way. If I would have to describe tranquillity with an experience, it would be this one. After my walk, I sit down at the Boathouse for a bowl of soup and a sandwich and before I know it, I’m back on the little boat, making my way to Mull. 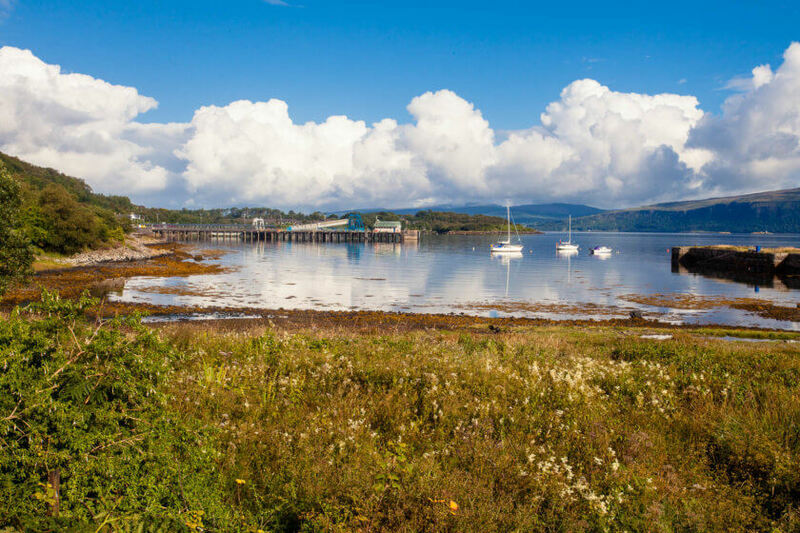 Of course, the Isle of Mull has a lot to offer itself as well, and so I spend the rest of my final day on the island, digging by toes into the sand at Calgary Beach, shopping for souvenirs and whisky in the quirky town of Tobermory and soaking up the last sun rays of the day by Duart Castle. 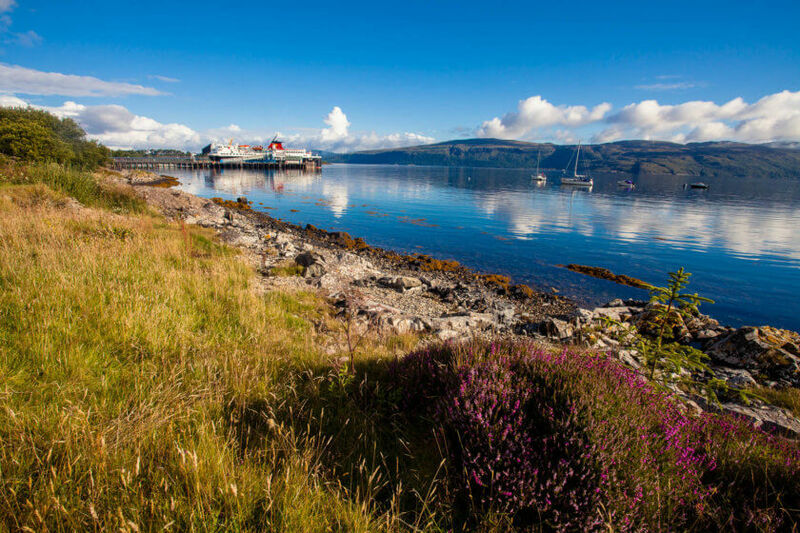 You can reach Mull by ferry from Oban (landing in Craignure). While this is easily doable from Glasgow or Edinburgh by public transport, I recommend renting a car for your time on the island. Busses are not as frequent as you might like! I was based in Craignure at Craignure Bunkhouse, because I wanted a central location that was somewhere between the west and the north of the island. If you are mostly interested in my island hopping day trip to Iona, Staffa and Lunga, you could also stay at a hostel in Fionnphort. I highly recommend booking accommodation and ferry tickets (if you bring a car across) as early as possible during the summer months. 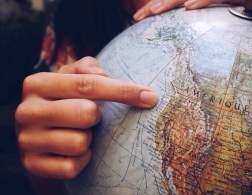 This is to avoid disappointment, save money and be more flexible in terms of your itinerary! As mentioned above, the easiest way to get around the Isle of Mull is by car. However, Mull is also a popular cycling destination, so bringing your bike across can be a great alternative! 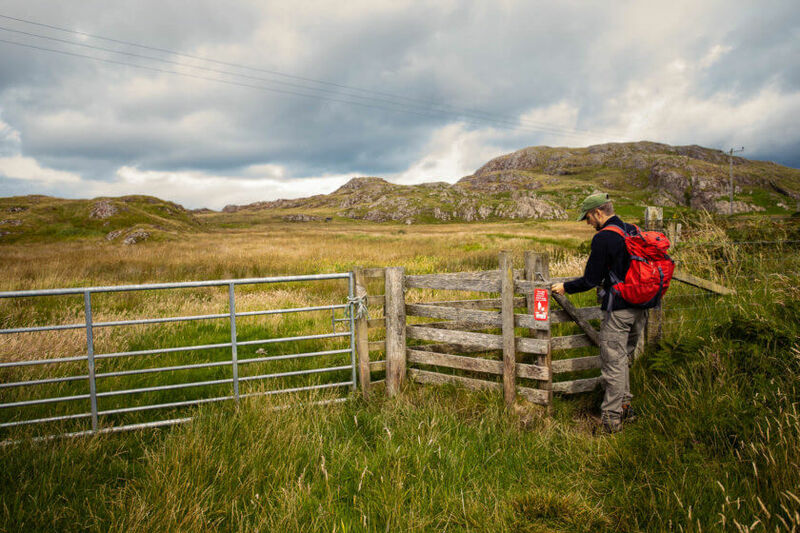 This beautiful travel story about cycling on Mull should give you some inspiration to start. Have I managed to change your idea of island hopping and convinced you to consider an island holiday in Scotland? 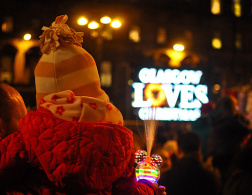 Or have you already visited and want to share your story? I’d love to hear from you! 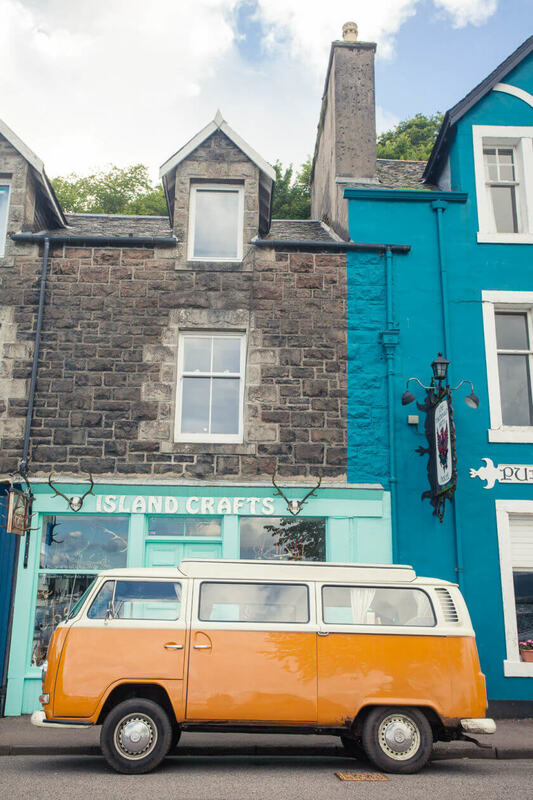 Find more inspiration for a trip to Mull in this blogpost about my own trip to Mull and the surrounding islands. If there's puffins, definitely count me in. They're the cutest, aren't they?!?!? 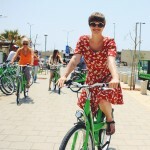 I won't stop repeating how much I love your blog! It is absolutely amazing - very well organised, inspiring, interesting and entertaining. What gorgeous places to visit! I really need to explore Scotland, I've only been once.